If there’s any particular way I enjoy my Guignol, I’d have to go with Grand. Whenever MG is asked to name the finest purveyor in the G.G. market, we would always put forth the Fellini of Burbank, Mr. Tim Burton. Right from Pee-Wee’s Big Adventure (1985) and Beetlejuice (1988), that guy had me and I pegged him for an exciting new filmmaker with much more goodness to come. Goth not by preference, but by reality; Burton’s decidedly dark leanings clashed with the perpetually sunny southern California of his upbringing. I am convinced that the adversity of being a cultured, monochromatic misfit in a land of cars, muscle beaches and vacuous blondes, shaped our auteur into a seminal filmmaking voice for wistful, black-clad outsiders everywhere. Burton’s love of film, especially horror and Sci-Fi from the 50’s and 60’s have manifested themselves into his productions like Edward Scissorhands (1990), Ed Wood (1994) and Mars Attacks (1996). Having played the loner in his real life, what has always been compelling about Burton is his ability to scratch the surface of a purported monster and find the humanity that nearly anyone will have missed. 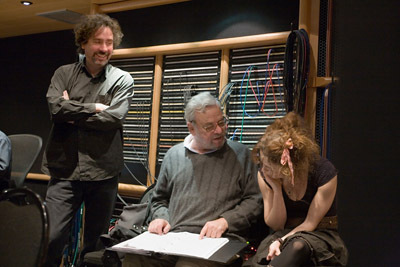 In each of his films music plays a huge part: Though no longer working together, Burton’s long, successful collaboration with composer Danny Elfman gave us some of the most memorable scores of the past latter century (- Pee Wee’s Big Adventure, Batman, Beetlejuice and Mars Attacks are some standouts). 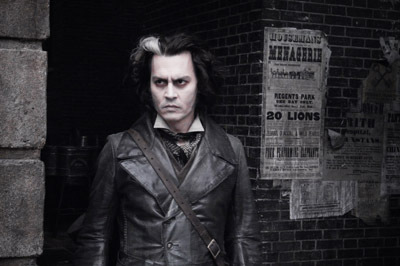 So it was with unbridled glee that I prepared myself for Burton’s take on a full-fledged musical, Sweeney Todd: The Demon Barber of Fleet Street, the story most famously brought to Broadway by Stephen Sondheim. 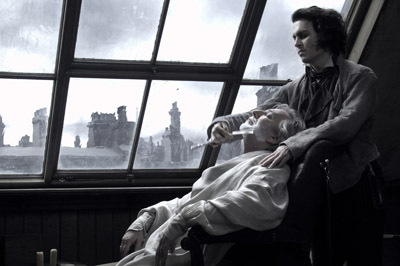 Having attempted the genre before with the stop-motion animation of The Nightmare Before Christmas (1993) and The Corpse Bride (2005), as well as Charlie and the Chocolate Factory (2005) with varying degrees of success; my expectations were still high due to the subject matter – a vengeful barber sent to prison on false charges returns to London in search of his lost family and a little payback – and the inclusion of one Mr. John Christopher Depp II, Burton’s greatest muse and alter-ego. 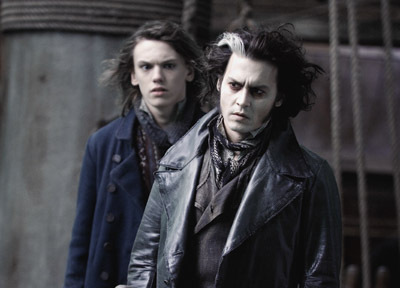 The magic combination of these two off-the-beaten-path talents that began with Edward Scissorhands (- right at the height of Depp’s 21 Jump Street teenybop godhead), has continued to grow and each spurs the other on to great creative heights. 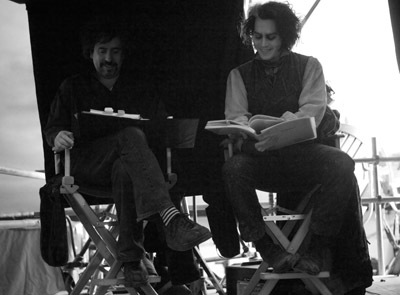 Burton and Depp get each other in a way that brings out their best. Kids, you know how we venerate Asian film here in the temple, so take it with no small magnitude when we tell you that in your beloved Elephant Head’s head, the pairing of Burton and Depp is the most kinetic and inspirational creative collaboration between director and actor since Kurosawa and Mifune, only no samurai swords … but there’s still time. On a ship arriving in a brick-thick London fog, a man looks out on the Thames with hollow, haunted eyes. Preternaturally pale with a bolt of white lightning through the ebony tangle on his head, we meet our hero. We find out in flashback scenes that he is the tonsorial artist formerly known as Benjamin Barker, honoured barber and well-respected family man who has the misfortune of having a beautiful wife. So coveted is Barker’s lovely and adoring spouse that she drives the lecherous Judge Turpin to drag Benjamin off on dodgy charges to the penal colony in Australia. 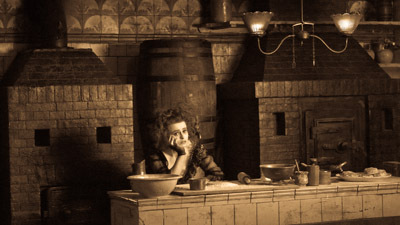 Having made an unexpected return, Barker takes up residence in the room above Mrs. Lovett’s meat pie shop where he, his wife and infant daughter once lived. Time, imprisonment, and a heart full of hate have not worn well on Mr. Barker and he is unrecognisable from the sweet-faced, happy man he was before his time in the nick. 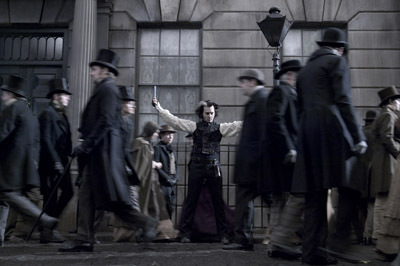 He is able to pass through his old haunts unnoticed and bears a new nom de guerre, Sweeney Todd. Mrs. Lovett, who was the family’s landlady before things turned nasty, has kept not only a torch for the former Mr. Barker, but the tools of his trade, a shining set of silver razors. The walking catatonic barber is seized a spark of life as he fondles the blade and cries, “At last, my arm is whole!” and here’s where the fun begins. Abetted and restrained by the loving Mrs. Lovett, the two embark on a bloodthirsty plan to get revenge against the lascivious Judge Turpin for all his crimes, including his adoption and ensuing betrothal of Todd’s now-grown daughter. 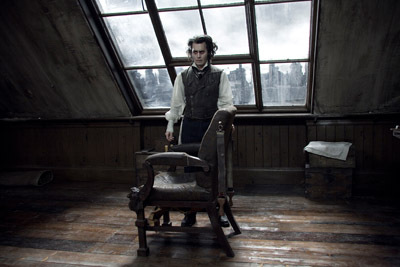 Recognising the handiness of their situation; a homicidal maniac in need of a place to hide his victims and a meat pie shop in need of cheap meat, Todd creates a mechanical barber chair with a convenient drop chute leading down to Mrs. Lovett’s man-sized meat grinder. 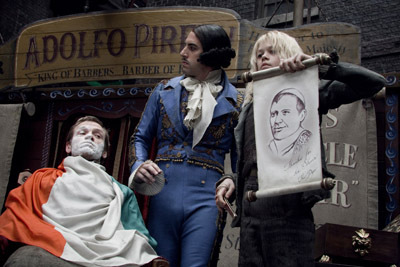 Todd and Lovett rise to fame as the best barber in London (- a title he takes dead seriously) and she as the baker of the most delicious meat pies on Fleet St., all the while hiding their little secret by eliminating all who would expose them, and waiting like spiders in a web for the inevitable arrival of Judge Turpin to Sweeney Todd’s barber shop. Kids, I loved it. I usually don’t have patience for people singing the majority of their dialog, as they do here, but in Sweeney Todd it all works. 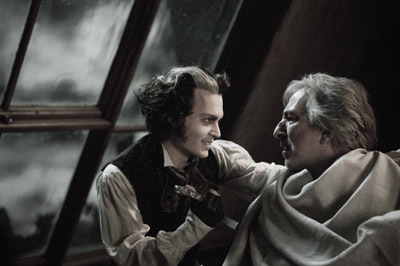 Depp is perfectly cast as the vengeful barber who can’t see anyone or anything else in his life for being so consumed with hate for mankind and one man in particular. Johnny’s voice runs from heartfelt and unpolished drones at Todd’s single-minded menace and roars with murderous exultation with the thought of facing his foe in the barber chair. 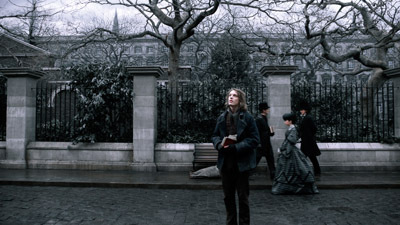 Helena Bonham-Carter reminded me of a live-action version of Sally from The Nightmare Before Christmas, swathed in rags, singing in her thin, reedy voice about baking “The Worst Pies in London” and mooning about with patient, unrequited love for an extremely preoccupied man. 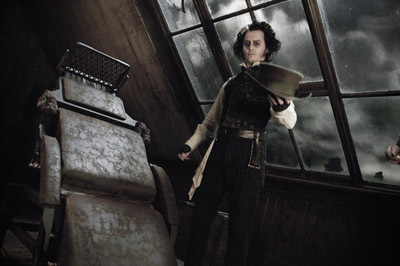 The only flaw in Todd’s and Lovett’s plan is their own last traces of humanity, they can’t quite be full-time monsters and both actors succumb believably. 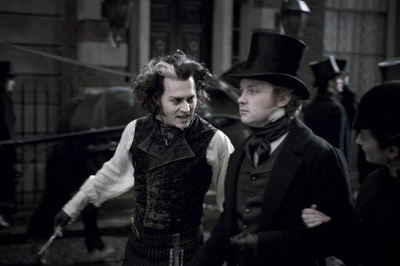 Depp and Bonham-Carter play off each other beautifully, understanding the underlying loneliness in each of the characters and reveling in their madness. 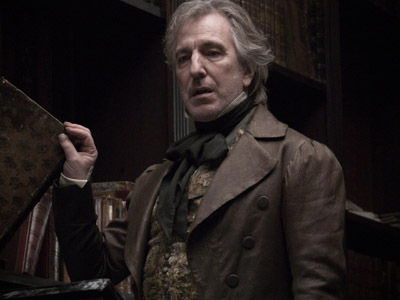 The mini-Harry Potter reunion of Alan Rickman (- who can do no wrong) as the perverted, corrupt Judge Turpin and Timothy Spall as his creepy, protective henchman is inspired, and Sacha Baron Cohen in an all-too small part as an oily, Italian competitor to Todd is a scream in more ways than one. 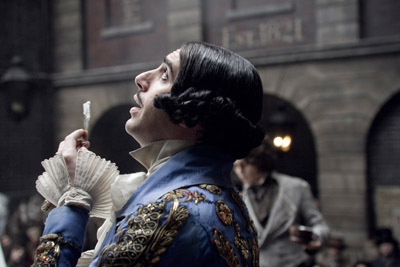 The production design is remarkable. In Dante Ferretti, Burton has followed through on the promise of his work with the late, brilliant Anton Furst (- who created the sets and look of Batman) held before Furst passed in 1991. 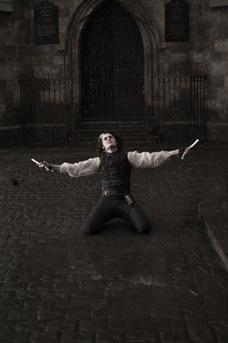 Creating an operatic look for Sweeny Todd, simultaneously lush and desolate, Ferretti achieves the wondrous feat of being able to realise the twisted, beautiful visions inside Tim Burton’s head, giving us 18th century London as drawn by Edward Gorey. 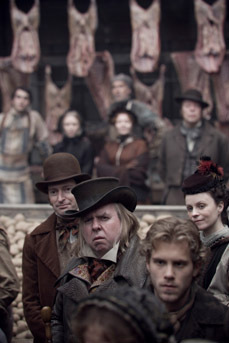 The stark minimalism of Sweeney Todd’s shop reflects the barrenness of his soul, his every haunt is covered in grayness and grime the audience can almost touch. 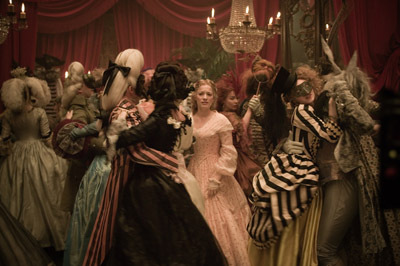 Particularly inspired was the brilliant sequence for the song, “By the Sea”, where Mrs. Lovett imagines of a life far from London with her adored, sociopathic barber. The saturated technicolour seashore plays foil for these two pasty, out-of-place, black and white rag dolls, as Mrs. Lovett sings her dreams of blissful domesticity tugging along the torpid, zombie-like Todd in her wake. And let’s hear it for the gore! 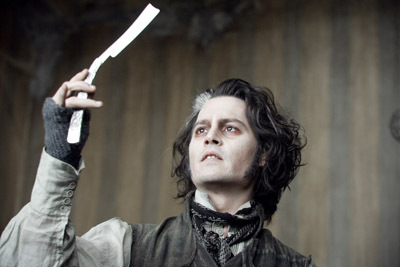 I couldn’t talk about the amazing look of Sweeney Todd without discussing the buckets of blood shed in it. Yes kids, it’s messy. As more and more throats are slit, more gushers of blood spray like geysers all over the place. The splashes of orangey-red fluids are only more startling for their brightness as they fly across the film’s nearly colourless palette. Like many scenes of violence in Burton’s films, the scenes here are wrapped in his fine sense of black humour and it’s the very volume of red stuff that keeps things from being too harrowing (- though this is an R-rated exercise, after all). Still, for the squeamish of the shrine, bring a friend to let you know when to uncover your eyes. There is one failing in the piece and that would be the rather abrupt ending. I won’t give anything away, but it did feel very sudden and unfinished and a bit unsatisfying. I can’t say I’m all that shocked; Burton is at his best when he can blur the lines of a set script and take liberties, allowing his visual style and touches to shine through. 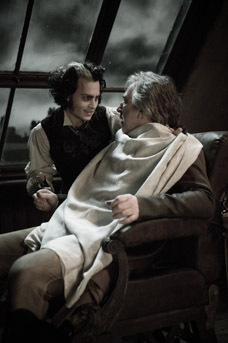 He’s what I call a messy director; a straight narrative will never be his thing; and so it goes with Sweeney Todd’s odd ending being the only off-note in the entire affair. Sweeney Todd is a marvellous return to form for that artist who had me at Large Marge and the Tequila big shoe dance so long ago. 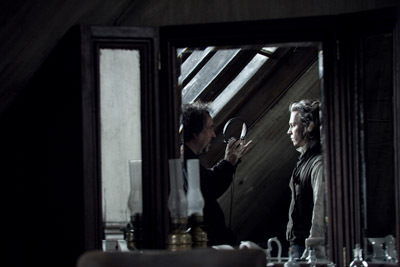 So attuned are director and storyline here that they are made for each other The last time I saw Burton find a vehicle that suited him so perfectly was in Sleepy Hollow, another monochromatic gore fest, and I found a lot of similarities between that film and this one in all the best ways. 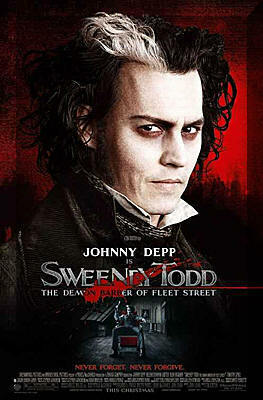 Sweeney Todd shows us Tim Burton as a director who’s not lost his touch and continues to grow as an artist.